I find myself wanting to tell you absolutely everything that happened in an absolutely jam-packed weekend, but try as I might, I would be sure to miss something or someone special. Also, I have books to write! So instead, I’m just going to give you the broad strokes and I’ll try not to gush too much! My sister and I drove to Peterborough overnight on Thursday, arriving early on Friday morning. After a quick nap in the car, meeting up with our mum, and a chance to freshen up, we arrived at the Bull Hotel, which was beautiful, and where the redcloaks were helpful and friendly, despite being rushed off their feet. I read from Ashael Rising during the first slot of the weekend to a busier room than I expected. The reading went well and was warmly received. Hopefully no-one really noticed my shaking hands! Even before the reading, a trend started that continued throughout the weekend – people approached me and said hello, welcomed me to my first con, offered hugs and help and companionship. I have never met a friendlier, more welcoming group of people. The rest of Friday was filled with panels and readings and a disco and I loved it all. Saturday morning saw me watching an episode of one of my favourite podcasts, Breaking the Glass Slipper, being recorded. At some point over the weekend I was able to speak to all of the hosts and I’m not ashamed to say I was a little star-struck. That was another theme of the weekend. The worldbuilding panel I took part in at lunchtime on Saturday went very well. The other panellists were all fantastic and I learned so much from them – once more my TBR list has exploded, as has my friends list on social media! I attended an excellent panel on the Emergency Services in Genre Fiction which was both interesting and funny. I was really sad when it was over but it was followed by an informative discussion on maintaining a career in publishing. 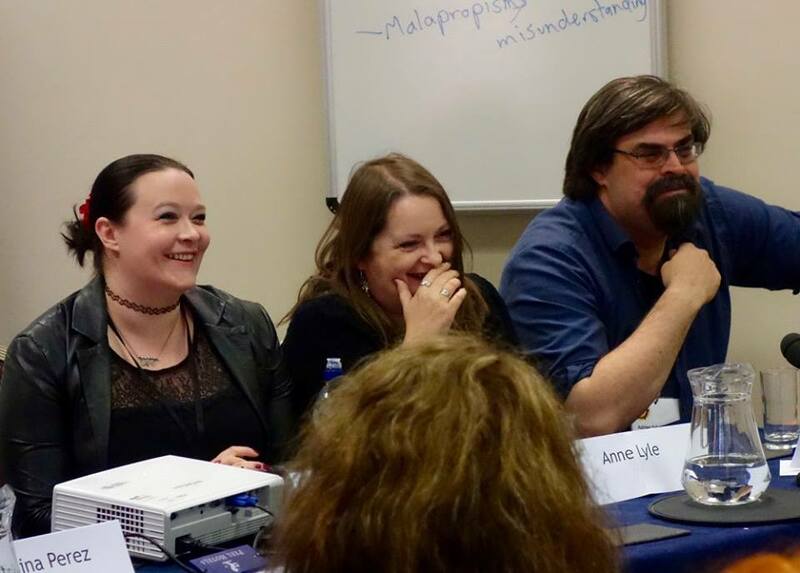 Then it was my turn to take part again, in a panel on writing short fiction, where the diverse opinions and experiences led to a great discussion. Saturday evening saw the karaoke and what I caught of it seemed like great fun – unfortunately I couldn’t be in more than one place at a time. I saw the Mythology and Folklore in Fantasy panel which I found fascinating – especially since there’s a lot of folklore and some playing with tropes in one of the novellas I’m working on. I finished the evening with a late reading slot and a few more books on my TBR list. I’d like to say that I was bright-eyed and bushy-tailed for the BFS AGM on Sunday morning but in reality I wasn’t caffeinated enough for that. I was there though and enjoyed the opportunity to find out about what’s happening with the Society. 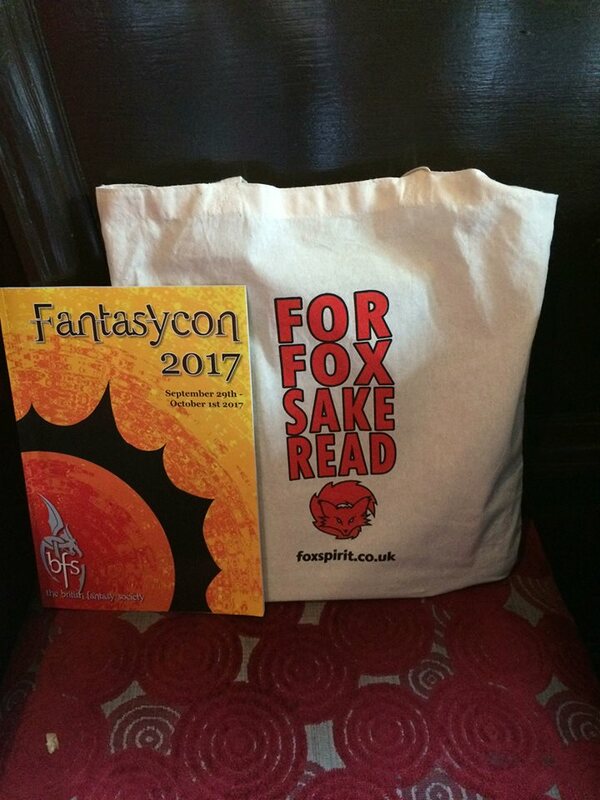 I also enjoyed hearing about the plans for next year’s fantasycon, which I ill be at if at all possible. Sunday morning was a little sad with lots of mingling and leave-taking. I didn’t get a chance to say goodbye to everyone I would have liked. I sat on one of the last panels of the weekend, talking about fantasy economy and it was massively fun – I only hope that some of the intelligence of the other panellists rubbed off a bit on me! The highlight of my weekend came at the end of that panel when an author that I have admired for some time went out of his way to speak to me. He was very kind and I was very tongue-tied! All in all, it was a brilliant weekend and I could ride the high from it for weeks. I was able to meet some internet friends in the flesh – Lucy Hounsom is just as lovely in person as she is on the internet – I made lots of new friends and I am filled with energy and enthusiasm for all of my writing projects. My heartfelt thanks go to all of the people who worked on this event, the redcloaks who were always helpful and friendly, Allen and Karen for organising a brilliant event and Phil Lunt for being so welcoming and making me feel right at home from the beginning of the weekend. I’m looking forward to doing it all again next year and I hope to see lots of you there!